Where to Buy Chipco 26019 Fungicide, Chipco 26019 Fungicide - 2 Lb - $109.95 for Sale with Fast Free Shipping! 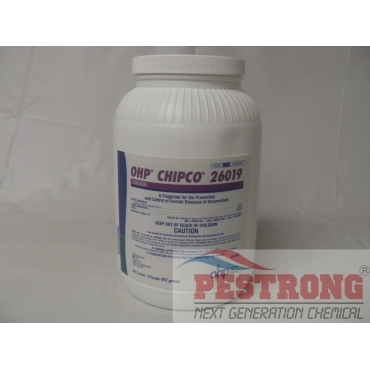 Chipco 26019 Fungicide - 2 Lb is contact, curative broad spectrum fungicides which inhibit germination of fungal spores and growth of fungal mycelium. Pendulum Aquacap Herbicide Pendimethalin -..
Chipco 26019 Fungicide(formerly Chipco 26019 N/G Fungicide) can be applied safely to a wide range of ornamental flowering and foliage plants, either as a spray, drench, or dip. For use on a wide variety of ornamentals in field or container nurseries, conifer nurseries, greenhouse, and in landscape settings (not for use on residential site). Foliar spray: apply 1 to 2 lbs. per 100 gallons of water to the point of runoff. Repeat applications may be made every 7 to 14 days. Drench: Apply at seeding and/or after transplanting for Rhizoctonia control at 6.5 oz. per 100 gallons of water. Apply 1 to 2 pints of solution per square foot. Dip: Dip in a solution of 1 to 2 lbs. per 100 gallons of water for five minutes prior to cold storage or planting.